Tragedy struck in the fight against terror group, Boko Haram, on Tuesday, when a fighter jet involved in the counter-insurgency operation in the North-East fired at aid workers, soldiers and displaced persons in error, killing no fewer than 100 persons on the ground. Aid workers confirmed to have been killed in the bombing included the officials ofDoctors Without Borders (Medecins Sans Frontieres), International Committee of the Red Cross and some refugees. But the Nigerian Air Force said in a statement on Tuesday evening that it had begun an investigation into the accidental air strike. The NAF Director of Information and Public Relations, Group Captain Ayodele Famuyiwa, said, “We are saddened by today’s accidental air strike by our fighter jet at Rann, in which innocent lives were lost. While available information is still sketchy, the loss occasioned by this unfortunate incident is deeply regretted. It was learnt that the accidental air strike happened at about 9am in Rann, in the far north of Borno State as aid workers distributed food to Internally Displaced Persons. A resident of the area, Abba Abiso, told AFPon the telephone, “This morning, a military jet mistakenly bombarded Rann, instead of (nearby) Kala. 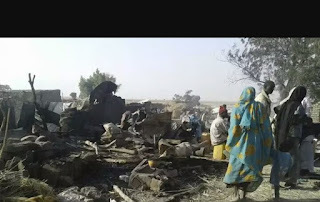 “In recent weeks, Boko Haram has moved base to Kala from Sambisa Forest and obviously, a military jet mistook Rann for Kala and bombarded it, killing many civilians. MSF said its teams were trying to provide emergency first aid at its facility in the camp and were stabilising patients to evacuate the wounded from the scene. “Our medical and surgical teams in Cameroon and Chad are ready to treat wounded patients. We are in close contact with our teams, who are in shock following the event,” it added. An official of the Borno State Government, one of those helping to coordinate the evacuation of the injured by helicopter, who spoke on condition of anonymity, said 100 people had been killed. MSF later, on Tuesday, put the figure of the dead at 95, admitting that it had yet to confirm the figure. The Theatre Commander of Operation Lafiya Dole, Maj. Gen. Lucky Irabor, who heads the military operation against the militants, said the Nigerian Air Force had been given coordinates of Boko Haram terrorists in the Kala-Balge area. “This morning, we received a report about the gathering of Boko Haram terrorists around the Kala Balge area of Maiduguri,” he told reporters at a briefing in Maiduguri on Tuesday. “I coordinated and I directed that the air component of the operation should go and address the problem. “Unfortunately, the strike was conducted but it turned out that the locals, somewhere in Rann, were affected. “So far, it is a little bit disturbing; death has occurred. There are casualties; there were deaths and injuries but on the actual number of casualties, we would get back to you later. “I am yet to get the number of casualties of civilians killed, but two soldiers were also affected. “Some humanitarian staff of Medicines Sans Frontiers and some staff of International Committee of Red Cross were also affected. Six workers of the ICRC were among the dead, while 13 others were said to have been injured. The Red Cross said it was “deeply concerned” about the reported casualties among civilians and humanitarian workers in the air strikes on Rann. The ICRC spokesperson, Ms. Matijevic Aleksandra, who confirmed the casualty figure of their workers, said the injured had been moved to a medical facility in Rann. She said, “We regret that among the casualties of today’s air strikes in Rann, there are six Nigerian Red Cross members killed and 13 injured. They brought desperately needed food for over 25,000 displaced persons. Also, the Acting Secretary-General, Nigerian Red Cross Headquarters, Andronicus Adeyemo, confirmed that six members of the ICRC died in the bombing. In an interview with The PUNCH, he said, “Six members of the Nigerian Red Cross have been confirmed dead, 14 wounded and nine are in critical conditions. That was the last count when we did staff audit. “We are in contact with the relevant authorities to organise medical assistance and evacuations, and also to get more information on the situation in Rann,” said the Information Officer of the ICRC in Borno State, Sadiq Umar. The Head of Media and Publicity of the National Emergency Management Agency, Mr. Sani Datti, told one of our correspondents that the camp in question was managed by the military. Datti said, “Let me tell you the truth, it is very difficult to get the figures because that camp is managed by the military. It is one of our satellite camps, but it is being managed by the military. Meanwhile, President Muhammadu Buhari, on Tuesday, said he received with deep sadness and regret the accidental bombing of a civilian community in Rann by the NAF. In a statement by his Special Adviser on Media and Publicity, Mr. Femi Adesina, the President condoled with families of the dead. While wishing the wounded divine succour leading to full recovery, the President also sympathised with the Borno State Government. Also, Borno State Governor, Alhaji Kashim Shettima, ordered state government’s health facilities to be on standby to attend to the victims of the air strike. The governor ordered the Borno State Ministry of Health to set up an emergency intervention team with the State Specialist Hospital, the Prof Umaru Shehu Hospital and General Muhammad Shuwa Memorial Hospital. He said all the hospitals should be placed on standby in readiness to carry out emergency treatment. The order of the governor was communicated in a statement to journalists by his spokesman, Mallam Isa Gusau. He stated that Shettima received the news of the sad incident with very deep concern. The statement added, “As of this evening, the International Committee of the Red Cross and Red Crescent has deployed a helicopter, which is on the ground at Rann to begin the evacuation of victims, starting with those with the most critical health conditions. “Governor Shettima particularly commends the MSF for its rapid response in providing first aid to victims at the scene.